City braces for more snow... or worse. City braces for more snow… or worse. 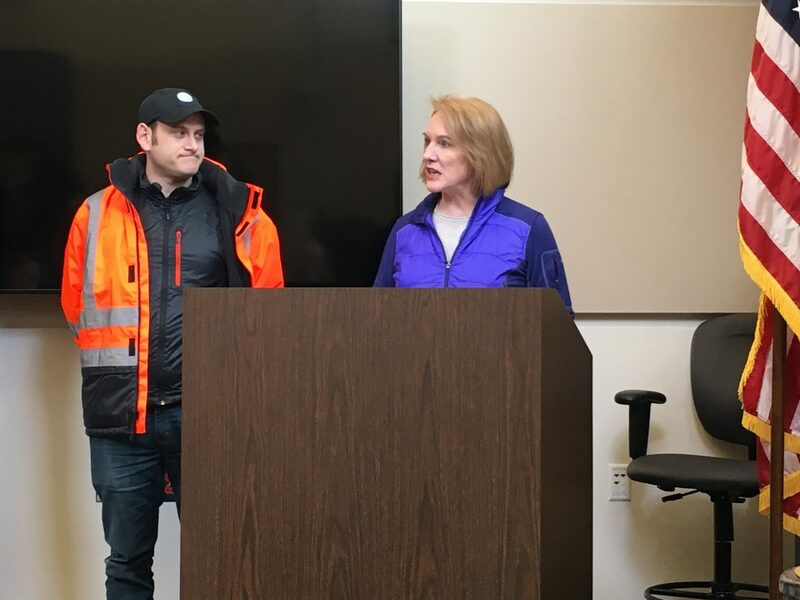 This afternoon, Mayor Durkan and several of her department heads held a press briefing on preparations for two more winter storm systems: one that arrived late this afternoon, and the second to arrive midday tomorrow. Tomorrow’s is the one they are all worried about. Durkan, who had just been briefed on the latest weather forecasts, said that the best-case scenario was a lot more snow — possibly 8-10 inches. The worst case is freezing rain, which builds up and can bring down trees, branches, and power lines. It can also turn streets and sidewalks into skating rinks with a solid layer of ice. The city will be re-activating the Emergency Operations Center at 5:00am tomorrow. SDOT continues to work 12-hour shifts around the clock, keeping the “emerald” and “gold” priority streets plowed. SDOT also has 30 workers out in “hand crews” with shovels and hand tools trying to clear curb ramps, bus stops, and sidewalks on bridges and in front of government buildings. SDOT has pre-positioned crews and trucks with plows and de-icer around the city in preparation for tonight’s snow. The Navigation Team will continue working around the clock to get unsheltered people inside. The Human Services Department (HSD) has been working to increase the available shelter capacity, and to centrally coordinate getting unsheltered people into those shelters. HSD Interim Director Jason Johnson said that there are now over 2000 shelter beds in Seattle, and listed several shelters that have open capacity. The Navigation Team has had two crews combing the streets of Seattle since Friday, making sure anyone living unsheltered knows where they can go to get indoors. Some shelters have reached overcapacity, and the Nav Team has been transporting people to other shelters where there is space for them. HSD, which directly provides in-home care for 12,000 seniors as well as services for people with disabilities, has been conducting round-the-clock phone trees to ensure that people are safe, their power is on, and they are getting the care they need. Seattle City Light (SCL) had very little to report, as the outages last week were fairly minor for a winter storm. The utility is resting its crews today in preparation for what might be a rough few days. The utility has asked its workers to pack an overnight bag to bring to work tomorrow, in case they can’t get home safely and need to spend the night (many SCL workers live outside the city). Seattle Public Utilities (SPU) has probably seen the most disruption to-date due to impassable roads, with many garbage pickups delated or rescheduled. SPU’s general manager, Mami Hara, thanked the utility’s customers for their patience. She said that Friday’s crews picked up 60% of Thursday’s customers, and over the weekend they caught up on commercial and critical customers. She also said that both the North and South transfer stations are open. SPU’s plan is to pick up from its regular Monday customers tomorrow, and if it can’t then it will operate on a 1-day delay (Monday pickup was cancelled last week, so their garbage is piling up). Hara said that if weather prevents operating on a 1-day delay, they will prioritize pickup from Monday customers. Clear your sidewalks, before the snow is compacted and icy. If you do need to drive, make sure your car is ready. Remove all snow and ice that has accumulated on the car. And when you’re driving, look out for pedestrians and plows. Please do not try to travel down closed streets. Report icy arterial roads and public sidewalks, and other hazardous street conditions, to 206-684-7623 (SDOT’s service line). When you are out shoveling snow, recognize that it can be exhausting work, stay hydrated, and take regular breaks. Make sure you’re taking the right precautions to stay safe. If you see someone unsheltered on the streets and you want to help them get inside, call 211 or 206-461-3222; they will have a list of available shelter. If you find an unsheltered person in crisis or distress, call 911. The city has crews with vans who can transport individuals to shelters. If you see downed power lines, are experiencing a power outage, or see other safety concerns, report it by callingSCL at 206-684-3000 or 911. Assume all downed power lines are live, and stay clear of them. Protect your pipes from freezing. Open cabinet doors, such as under your sinks, to ensure that warm air can reach pipes. Cover outdoor pipes and spigots. Durkan and her department heads thanks the residents of Seattle for their response to the snow to-date. They said that they have seen very low incidents of driving accidents and of people hurting themselves. They also thanks the city employees who have been working long hours, and the workers’ families for their ongoing support and understanding.